Charlemagne's reign was characterized not just with warfare, but also with his political achievements. He also made a significant improvement in literacy and culture of the Frankish Empire. Because of the tendency to the ideals of the Ancient Rome, and the very idea of restitution of literacy, culture and art, this period is called the Carolingian Renaissance. Charlemagne is best known for his war campaigns, most famous of which are those against the Saxons and the Avars. Apart from that, this article will also tell of the structure of the Frankish kingdom, as well as Charlemagne's government in general. 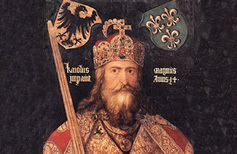 Charlemagne, one of the greatest European medieval rulers, lived from 747 to 814. In the first part of series of articles about Charlemagne, we will get closer with his private and family life and give an insight into his appearance and characteristics.